These days, I'm thinking about creativity, purpose, and the roadblocks to living a creative life of purpose. On my last post I asked what intimidated you. Thank you for responding so honestly. It seems that many, if not all, of us have something that we long to do, but because of various reasons, don't. George Eliot is accredited with the above words. They speak to me of the ongoing nature of human development. As long as God grants us breath and clear minds, we can be learning, exploring, challenging expectations, and growing. Becoming. I made the above collage because I was thinking about our visit to France five years ago (and wishing we could go again.) Vincent Van Gogh painted his heart out. Others designed and built the Pont du Gard, the Palais des Papes, and the hall in the Conciergerie. Others garden, creating beauty for themselves and passersby. Living a life that honors God and serves humanity can be done in so many ways. As I get older I am becoming more and more aware of the vast diversity of human experience and possibility. I want to embrace that, and let go of the things that intimidate me. Lorrie, it's a beautiful mosaic...hope that you do have the opportunity to visit France again since it is a heart's desire. I should analyze exactly what is holding me back... Superficially, I'd say that it is probably a circular problem and everything is interconnected and I'm having a time trying to find the end of the tangled whole. Gosh, you do make me think! Lovely mosaic, Lorrie. You have a gift for crafting sentences, prayers, thoughts-out-loud. Go with it! I like your blog very much, so I became your newest follower. Lovely photos from your visit to France. It would be nice if we were all able to do things we have been longing to do. Mine would be a trip to Ireland. Lovely mosaic, have a great week! Lorrie you often have such thought provoking posts. If all of us were able to help others in our community we'd all be better for the giving. Beautiful photo's. Wonderful mosaic and I love your words! Terrific post. Beautiful mosaic...and thought-provoking words! Yes...living a life that honours God and serves others can be done in so many ways. What a beautiful mosaic! Traveling is the one thing I would like to do, but I'll never get it done. It's not intimidation, but I'm a homebody and have chosen to farm and have animals. I certainly think you should dare to do all those things that you'd like to try. I think letting go of the things that intimidate us is a noble ambition and wish you success in achieving it. I'll work to that end as well. Your mosaic is beautiful and inspirational. Thank you for the words of wisdom and eloquence. Sweet post Lorrie, We would all be so much happier if we could just let go of intimidations and be ourselves. 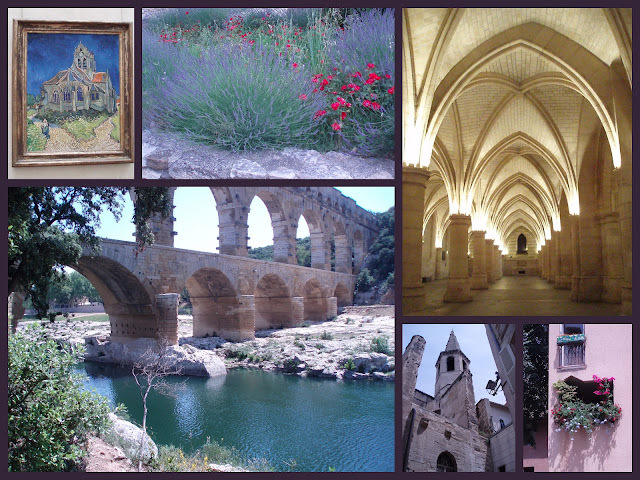 Love your pretty collage of France! Ah, France! It is certainly on my bucket list. Your mosaic is beautiful!